Europe is a continent that comprises the westernmost part of Eurasia. Europe is bordered by the Arctic Ocean to the north, the Atlantic Ocean to the west, and the Mediterranean Sea to the south. To the east and southeast, Europe is generally considered as separated from Asia by the watershed divides of the Ural and Caucasus Mountains, the Ural River, the Caspian and Black Seas, and the waterways of the Turkish Straits. Yet the non-oceanic borders of Europe—a concept dating back to classical antiquity—are arbitrary. The primarily physiographic term "continent" as applied to Europe also incorporates cultural and political elements whose discontinuities are not always reflected by the continent's current overland boundaries. Europe covers about 10,180,000 square kilometres (3,930,000 sq mi), or 2% of the Earth's surface (6.8% of land area). Politically, Europe is divided into about fifty sovereign states of which the Russian Federation is the largest and most populous, spanning 39% of the continent and comprising 15% of its population. Europe had a total population of about 740 million (about 11% of world population) as of 2012. The history of Europe covers the peoples inhabiting the European continent from prehistory to the present. Some of the best-known civilizations of prehistoric Europe were the Minoan and the Mycenaean, which flourished during the Bronze Age until they collapsed in a short period of time around 1200 BC. The period known as classical antiquity began with the emergence of the city-states of Ancient Greece. After ultimately checking the Persian advance in Europe through the Greco-Persian Wars in the 5th century BC, Greek influence reached its zenith under the expansive empire of Alexander the Great, spreading throughout Asia, Africa, and other parts of Europe. The Roman Empire came to dominate the entire Mediterranean basin in a vast empire based on Roman law. By 300 AD the Roman Empire was divided into the Western and Eastern empires. During the 4th and 5th centuries, the Germanic peoples of northern Europe grew in strength and repeated attacks led to the Fall of the Western Roman Empire. AD 476 traditionally marks the end of the classical period and the start of the Middle Ages. The culture of Europe is rooted in the art, architecture, music, literature, and philosophy that originated from the European cultural region. European culture is largely rooted in what is often referred to as its "common cultural heritage". A panoramic view of the interior of the Colosseum in Rome, Italy. Built in the 1st century AD as a site for gladiatorial shows as well as a variety of other events, the Colosseum is now a major tourist attraction. Sicilian Baroque is the distinctive form of Baroque architecture which evolved on the island of Sicily, off the southern coast of Italy, in the 17th and 18th centuries. The style is recognizable not only by its typical Baroque curves and flourishes, but also by its grinning masks and putti and a particular flamboyance that has given Sicily a unique architectural identity. Louise de Broglie, Countess d'Haussonville (1818 –1882) was a French essayist and biographer, and a member of the House of Broglie, a distinguished French family. Titled from birth (as was the custom in her father's aristocratic family) as Louise Albertine, Princess de Broglie, she was the daughter of statesman and diplomat Victor de Broglie, 3rd Duke de Broglie and Albertine, Baroness Staël von Holstein. Perast is an old town on the Bay of Kotor in Montenegro. It is situated a few kilometres northwest of Kotor and is noted for its proximity to the islets of St. George and Our Lady of the Rocks. 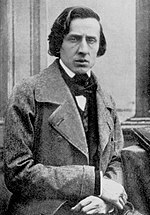 Frédéric François Chopin (March 1810 – 17 October 1849), born Fryderyk Franciszek Chopin, was a Polish composer and virtuoso pianist of the Romantic era who wrote primarily for the solo piano. He gained and has maintained renown worldwide as a leading musician of his era, whose "poetic genius was based on a professional technique that was without equal in his generation." Chopin was born in what was then the Duchy of Warsaw and grew up in Warsaw, which in 1815 became part of Congress Poland. A child prodigy, he completed his musical education and composed his earlier works in Warsaw before leaving Poland at the age of 20, less than a month before the outbreak of the November 1830 Uprising. The Mendip Hills is a range of limestone hills to the south of Bristol and Bath in Somerset, England. Running east to west between Weston-super-Mare and Frome, the hills overlook the Somerset Levels to the south and the Chew Valley and other tributaries of the Avon to the north. The hills give their name to the local government district of Mendip, which administers most of the area. The higher, western part of the hills, covering 198 km2 (76 sq mi) has been designated an Area of Outstanding Natural Beauty (AONB), which gives it a level of protection comparable to a national park. The hills are largely formed from Carboniferous Limestone, which is quarried at several sites. Three nationally important semi-natural habitats are characteristic of the area: ash–maple woodland, calcareous grassland and mesotrophic grassland. With their temperate climate these support a range of flora and fauna including birds, butterflies and small mammals. The dry stone walls that divide the pasture into fields are of botanical importance as they support important populations of the nationally scarce wall whitlowgrass (Draba muralis).